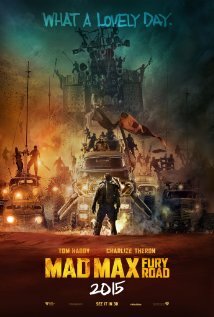 Mad Max: Fury Road is set in a post-apocalyptic world (yes, another one), in an arid desert wasteland, where warring factions made up of grotesques battle each other in enormous vehicles (1000 horsepower) called “war rigs” that seem to be made up of parts of old cars and trucks. These people have reverted to a kind of primitive state in which one person, named Immortan Joe (the most grotesque of them all), “owns” all the people because he “owns” all the water. A woman named Furiosa has “stolen” some of Immortan Joe’s “breed stock” (five scantily clad girls, one of whom is carrying his child) to free them and also to take them with her to the “green place” of her birth. We can see that Furiosa has not had an easy time of it; her left arm is missing below the elbow. She keeps the girls hidden in her war rig as she tries to flee with them. Enter Max Rockatansky, or Mad Max (Tom Hardy). Max tells us right at the beginning that he is driven by his instinct for survival in this hellish world and is haunted by the people he wasn’t able to save, including, apparently, his own small daughter who appears in his vision at odd times. This is about all we ever learn of Max. He is taciturn in the way of movie heroes, not nearly as menacing as the other men in the movie, and is more than capable of taking care of himself and anybody else he wants to take care of. He joins forces with Furiosa and the breed stock girls, helping them to get to where they think they want to go and flee from their menacing pursuers. We see that Furiosa likes Max but there’s no room here for romance—everybody is in too much danger and too hot and sweaty. Mad Max: Fury Road has everything you would expect from an action-adventure movie: loudness, fiery explosions, a pulsating music score, unintelligible dialogue, lots of frenetic action, death-defying stunts, and good against not-so-good. This one also has character names such as Slit, Nux, Rictus Erectus, and Toast the Knowing. I see on IMDb that it’s not a remake of the 1979 Australian movie with Mel Gibson but a different story using the concept and setting of the earlier movie. Everything that was at one time a movie hit (that is, made money) will eventually find its way into the forefront again if you give it enough time.